Flight through a µCT-image stack of a lapillus of the volcano Katla in Iceland. Find spot: Beach near Vik at the end of road 215. Acquisition done using "CT Alpha" by "Procon X-Ray GmbH", Garbsen, Germany. Resolution 11,2µm/Voxel, width approx. 24 mm. 3D-Rendering of the above image stack, in parts transparent. Heavy particles in red. 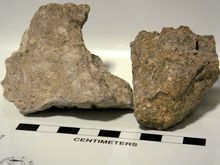 Pyroclastic rocks or pyroclastics (derived from the Greek: πῦρ, meaning fire; and κλαστός, meaning broken) are sedimentary clastic rocks composed solely or primarily of volcanic materials. Where the volcanic material has been transported and reworked through mechanical action, such as by wind or water, these rocks are termed volcaniclastic. Commonly associated with unsieved volcanic activity—such as Plinian or krakatoan eruption styles, or phreatomagmatic eruptions—pyroclastic deposits are commonly formed from airborne ash, lapilli and bombs or blocks ejected from the volcano itself, mixed in with shattered country rock. Three modes of transport can be distinguished: pyroclastic flow, pyroclastic surge, and pyroclastic fall. 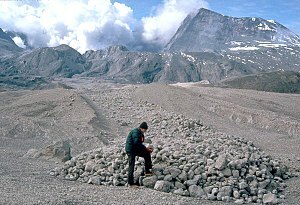 During Plinian eruptions, pumice and ash are formed when silicic magma is fragmented in the volcanic conduit, because of decompression and the growth of bubbles. 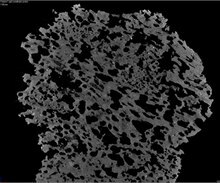 Pyroclasts are then entrained in a buoyant eruption plume which can rise several kilometers into the air and cause aviation hazards. Particles falling from the eruption clouds form layers on the ground (this is pyroclastic fall or tephra). Pyroclastic density currents, which are referred to as "flows" or "surges" depending on particle concentration and the level turbulence, are sometimes called glowing avalanches. The deposits of pumice-rich pyroclastic flows can be called ignimbrites. A pyroclastic eruption entails spitting or "fountaining" lava, where the lava will be thrown into the air along with ash, pyroclastic materials, and other volcanic byproducts. Hawaiian eruptions such as those at Kīlauea can eject clots of magma suspended into gas; this is called a "fire fountain". The magma clots, if hot enough may coalesce upon landing to form a lava flow. Pyroclastic deposits consist of pyroclasts which are not cemented together. Pyroclastic rocks (tuff) are pyroclastic deposits which have been lithified. ^ Heiken, G. and Wohletz, K., 1985 Volcanic Ash, University of California Press;, pp. 246. Wikimedia Commons has media related to Pyroclastic rocks.